Last year the French Heavy/Power Metal band NIGHTMARE released “One Night Of Insurrection”, a live release (CD/DVD) in the light of their 30 years existence. You can read my review here. This album came after their 2009 release “Insurrection” (see review), which was the band’s first release for AFM Records. I had the pleasure to see NIGHTMARE at work at Power, Prog and Metalfest in Mons, Belgium last year and they sure delivered the goods. Now, since the 18th May 2012, the follow-up to “Insurrection” is out. On this album the band remains true to its Heavy/Power roots, but added symphonic input to make the songs more lively, to better express the lyrical context, which isn’t exactly about happy happy, joy joy things. There was also a line-up change: guitarist Matt Asselberghs replaced the retired JC Jess. Ten tracks are to be found on “The Burden Of God”, eleven if you add the bonus track “Afterlife”, one of the two tracks written by producer Patrick Liotard (the other track is “Final Outcome”). The album begins with a symphonic intro (“Gateways To The Void”), setting the mood, introducing the story, so to speak. “Sunrise In Hell” is built with the main rhythm, followed by midtempo melodic Heavy/Power Metal. It’s firm and dark-edged, but also catchy and with Jo’s passionate vocals. There is a small speed increase in the bridge and melodic chorus, which has a hymnic character. The solo is backed by powerful, bursting music, reminiscent of the bridge. “The Burden Of God” is a song full of dark riffing, sounding not only powerful, but also doomy (in terms of atmosphere, not music). Firm midtempo Power Metal remains the standard and with very fitting vocals. Things slow down in the symphony-laden chorus, while full melodicness comes out in the chorus, which is catchy at the same time. The solo is not that far away. This song is simple in structure, like before, but it is effective. The music is melodic and atmospheric, comes fading in in “Crimson Empire”. You can feel the created tension. Slow Metal follows and allows for an easy take off into firm midtempo territory with a catchy rhythm. This sounds indeed very 80’s. I like it! The melodicness in the bridge rises to a climax to burst into the chorus where the Metal pounds, the melodic level is very high and Jo’s singing is also louder. The solo is short this time. Now, with “Children Of A Nation”, NIGHTMARE enters Doom Metal territory, albeit with symphonic guidance. A short midtempo increase forms the transition with the slow, symphonic verses, which are firmer and devoid of symphonic input in the next instant. The chorus is, as you might expect, symphonic and slow. The last part is heavier, firmer and faster. The title is then also sung by children. Over halfway the solo comes out, and the intro theme returns for a moment before it’s back to business as usual. Overall, another strong track, though I found it a little strange to hear NIGHTMARE with such a quantity of symphonic input. “The Preacher” is next, having a clean, atmospheric intro. Jazzy even, with effect for a livelier setting. And then the preaching begins. Gloomy, symphonic Power Metal sets in with catchy elements, both rhythm and melodies (strings and brass?). They then make way for pure and firm Metal, rocking like the Swiss band SHAKRA. Jo’s passionate vocals go well with the music. The chorus is bombastic and confirm the greatness of this track. “Shattered Hearts” then. Guitars fading in, tension growing, symphonic elements being added… same thing counts for the verses, but with toms instead of regular drumming. This sounds more relaxed, though you can be sure firm Metal will follow. The chorus is melodic and easier in flow and music. After the solo, the song is rebuilt like before, going into the chorus and towards the end. In “The Doomsday Prediction” it’s power time! Slow building first with added symphonic melodies to then take off! Andit sounds so damn tastey! The tempo remains invariable, even in the chorus. Halfway a demonic intervention is due, before the obligatory solo moment (and so on). Great stuff! “The Dominion Gate III” is, obviously, part 3. The two previous parts can be found on “The Dominion Gate” (2005) and “Genetic Disorder” (2007) albums. First you get an atmospheric Metal intro, which sounds grand and epic. Headbang-friendly Metal is next, simple and effective in being a kick in the rear. Magali Luyten (VIRUS IV, BEAUTIFUL SIN, EPYSODE) offers guest vocals, forming a nice duet with Jo Amore. The music is slower, but melodic, in the bridge and chorus. There is also a symphonic break, very cinematic. Add a choir and the picture is complete. Speed is increased again and so the whole grows in bombast and flows into the bridge, chorus and heads for the end. Last, there are the two tracks producer Patrick Liotard contributed: “Final Outcome” begins in an atmospheric way. The Metal falls in with a bang. Melody is key, but so is the firmness of it all. However, in the light of the dark mood of this album, the music is also emotional, a little more than the other songs. Especially Jo’s vocal input is testimony to this. The chorus is relies more on feel and melody than heaviness. The bonus track, “Afterlife”, is one I liked very much, to be honest. It’s of course symphonic, but fast and übercatchy! It’s got groovy Metal, almost Nu-Metal (no, that’s not what I like about it), very modern in rhythm. Hence being a bonus track, as it differs significantly from the other tracks. The chorus is melodic, of course, and reminded me of the German band BRAINSTORM. It’s something else, but nice to hear NIGHTMARE like this. Even if I prefer their regular material. Truth be told, this style is too modern for them, too American somehow. Indeed, it took me a while to write this review, due to various reasons. But it also allowed me to discover what a great album “The Burden Of God” really is. 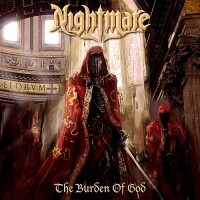 NIGHTMARE clearly have put time and effort in creating this new epic piece of Metal. It sounds grand, catchy, fantastic and more. I also like how they implemented an 80’s touch here and there. The symphonic addition is not omni-present, luckily, but it makes the songs more alive, one way or another. The production is also very good. Could this be NIGHTMARE’s best album to date? In any case, another release for the Best Of 2012 list.